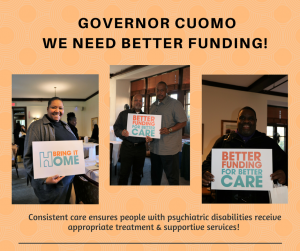 Bring it Home is a coalition of community-based supportive housing providers, mental health advocates, faith leaders, and consumers and their families, urging New York State to adequately fund community-based housing programs for individuals with psychiatric disabilities. Full recovery and community reintegration depends on stable housing opportunities. Through education and advocacy, Bring it Home is working to bring better funding for better care to New York.